Wish your father the merriest of holiday seasons with the DAD personalized Christmas ornament that sparkles with glitter and cheers with festive spirit. He'll enjoy receiving this family ornament personalized just for him with the custom message you provide. One of our lettering pros will handwrite it in a handsome font before we tuck the ornament in to our velvet drawstring gift and storage bag. These dads ornaments also include an attractive cord that makes it very easy for him to hang it on the tree, by the fire or even in his work location. 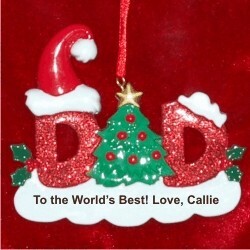 If you're looking for gift ideas for Dad, the DAD Christmas ornament personalized just for him will be a sure winner. Christmas Remberance Oct 26, 2015 Donna G.